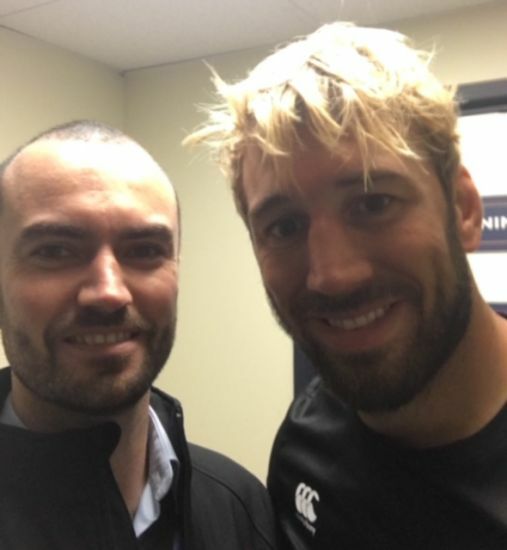 Home/Sport Centre/Sports Centre staff meet England stars! 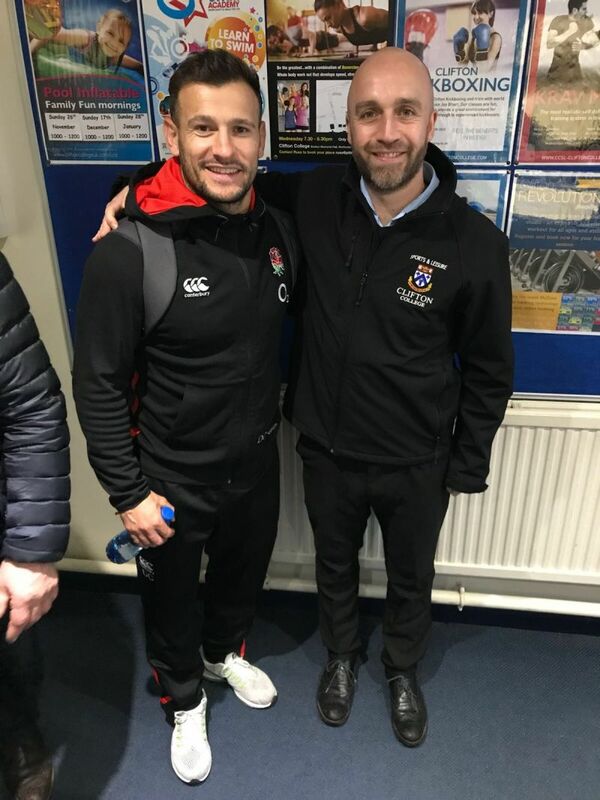 It was a day to remember for the hard-working Clifton College Sports Centre team on Monday 6th November when the England and Wales Rugby teams visited for a joint training session! The event organisation had been long in the making, but with the insistence from the respective management teams that it was ‘behind closed doors’ event, we had to keep things under wraps! The scene was set the day before on Sunday, when a support team came in and installed almost 2 tonnes (!) of fitness equipment in our Gymnasium Hall, for specific use by the England team. 60kg dumbells and weights plates to make your eyes water were all carried up the stairs by 2 guys, a job which took almost 8 hours, and all for only a 1 hour weights session by the England team on Monday morning! The team arrived at 0830 on the dot on Monday morning and headed up to start their session, much to the surprise of many Sports Centre members who were blissfully unaware that such famous sportsmen would be training alongside them for the morning! After their session had finished, it was back in to the changing rooms and outside on to the Close for some scrummaging with their Welsh counterparts. The Clifton College pitches held up well under the huge weights put through them, although the Head Groundsman’s tears were evident on the side of the pitch! The morning finished with the England team heading back in to get changed, before kindly posing for photos and signing a truckload of shirts and balls upon their exit! But not before leaving the changing rooms pristine clean and tidy, even sweeping up after themselves! If only the College students were so helpful! 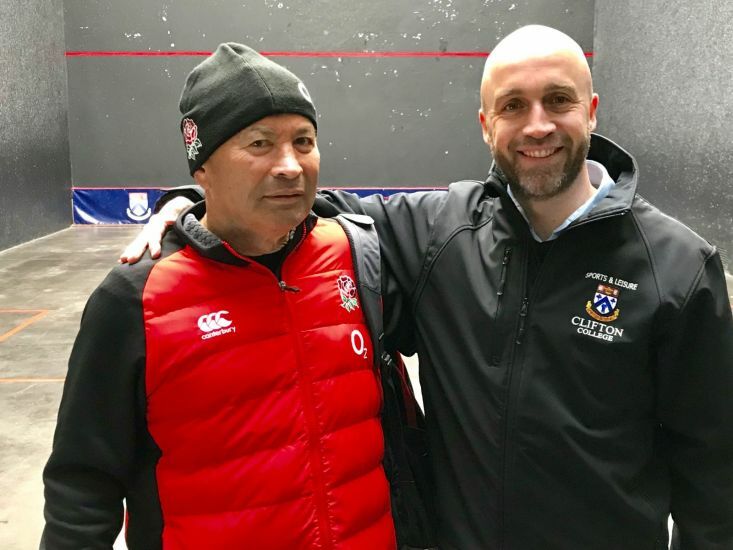 A couple of the Sports Centre team had met Eddie Jones before when he came here with Japan before their training session before the 2015 World Cup, and he was as genial and friendly as always when greeting the staff. Danny Care was particularly complimentary of the facilities, although Courtney Lawes at 2.01m tall had to duck through many of the doors around the Sports Centre!